Information and advice on the government backed CompetentRoofer scheme, run by the National Federation of Roofing Contractors (NFRC - National Federation of Roofing Contractors), which aims to uphold industry standards and give reassurance to the homeowner. Find out what works are allowed under this scheme and what work Competent Roofing scheme members are allowed to carry out. Also find out what checks scheme members undergo in order to join the scheme and also how their work is inspected and how mistakes are rectified. Things are moving quickly in the roofing industry! The National Federation of Roofing Contractors (NFRC) has been concerned for some time about the dangers of declining standards in the industry caused by the activities of cowboys. In November 2010, at the Annual General Meeting of the North West Roofing Training Group, the matter was discussed in detail. Despite the current shortage of work, it was felt that the standards of good roofing practice should not only be maintained but improved. The Chief Executive Officer at the time, Ray Norwood, of the NFRC told members about the proposed Competent Roofer Scheme (CRS) and the questions he received from members confirmed the need for action. There are a great many bonuses for homeowners when they choose to use a CompetentRoofer Member. They will not only save time with building regulations but also save money when it comes to inspections by building inspectors. In terms of confidence there are also advantages here in that they can be sure that any work is fully compliant with the building regulations. What is the Competent Roofer Scheme? The CRS is derived from the government’s Competent Person Scheme and the NFRC has been authorised to set up and administer a scheme for the roofing industry called CompetentRoofer. It would be open to all roofing companies but NFRC members would have an advantage over non–members in that they are already operating at the required skill level so would be doubly qualified. 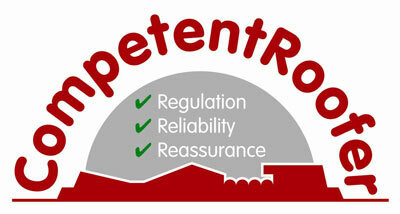 What Does the Competent Roofer Scheme Cover? The type and scope of the work covered has been defined and includes new and repair work to flat and pitched roofs, basically covering all types and forms roofing discipline. The scheme also covers works to domestic, commercial and industrial properties. It also covers the repair and/or the replacement of structural roof timbers (except roof trusses), the provision of insulation, flashing, guttering, eaves and verge work and the installation of roof windows (but not any structural work necessary to accommodate them). What Happens on Completion of a Roofing Job? The procedural arrangements for the running of the scheme have been set out. On completion of a job, the CompetentRoofer company must provide a written statement confirming that the work complies with the current building regulations. This relieves the client/householder of the task of calling in a Building Inspector to approve the work and will save a fee of between £200 and £400. This statement will then be sent to the NFRC by fax or online who will pass it on to the Building Control department of the local authority. Roofing companies in the scheme will be subject to two site audits a year. Minor faults must be rectified within 28 days but bigger discrepancies will require a second inspection which will be charged for. Persistent failures will result in the company either undertaking further training or losing their membership. All members will receive a copy of ‘CompetentRoofer Guide to Building Regulations’ and this can be downloaded from the NFRC website. The CEO of the NFRC has stated that a CompetentRoofer scheme would ensure that roofing standards will be maintained and improved to the detriment of cowboys operating in this field. The introduction of this scheme will benefit both the industry and the public. Most building work commissioned by householders can be inspected and approved or otherwise by a visual inspection of the finished product. Roofing work, however, is different. The effectiveness of roof repair work will not become apparent until a prolonged spell of wet weather arrives. If the repair work was carried out by an inexperienced unqualified person (aka a cowboy), he will be out of sight and reach when the effect of his shoddy work appears on the ceilings and walls! This scheme will not eliminate cowboy roofers completely but it should reduce their activities considerably – let’s hope that this type of scheme is adopted by other trades as soon as possible! If you are interested in finding out more about CompetentRoofer and the objectives of the scheme and also finding a member to carryout work on your property, check out their website here.